We will use your details to send you information about campaign opportunities. Your information may be shared with other members of the oOh! Group both in Australia and overseas. You have a right to access certain personal information that we collect and hold about you. You may contact us at privacy@oohmedia.com.au. Further information is available here. We’re excited to announce that oOh! has secured the advertising rights to Qantas’ Inflight Entertainment. This means we can now help advertisers and marketers reach 28 million domestic and international Qantas passengers annually, connecting with them throughout their entire journey – from departure to arrival. Testament to oOh!’s long-standing partnership with Qantas, this is the first time an out of home company has been contracted by an airline to provide advertising and content both at the airport and in the air. oOh! 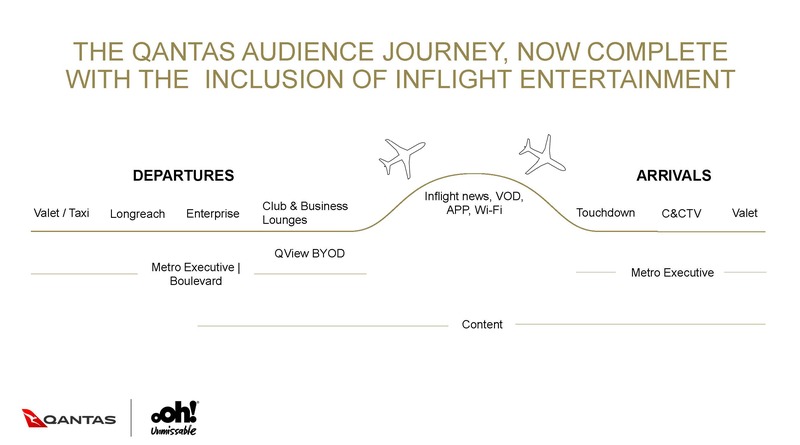 can now provide brands with an uninterrupted audience solution to target the premium Qantas traveller. Plus, given our entire offering is underpinned by transactional data from more than 300 Quantium buyer segments, we can allow for more accurate targeting than ever.